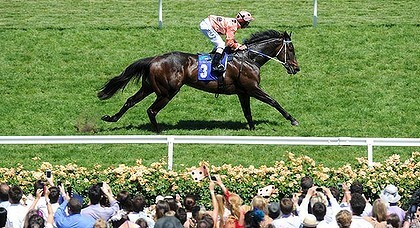 THE last opportunity to buy a half-sister to world champion Black Caviar was snapped up by a US company for $2.6 million. BTC Thoroughbreds, which buys yearlings with a view to training them up before reselling at a later date, topped the bidding for the filly at the William Inglis sale in Sydney. The result put an end to months of uncertainty for breeder Rick Jamieson who admitted he had agonised about his decision to put the filly, by Redoute's Choice out of Helsinge, under the hammer. The youngster will be trained by Danny O'Brien in Melbourne. As well as Black Caviar, Helsinge has also produced unbeaten two-year-old colt All Too Hard which sold for $1.025 million at last year's William Inglis sale and will start favourite in Saturday's Sires Produce Stakes at Randwick.